There is full disabled access to ALL facilities at the Scarborough Bowls Centre. Special buggies are available that can be used on the green. 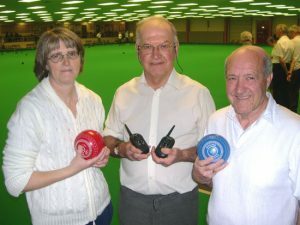 A registered Charity, the Bowls N’Buggies Club was formed on 27th October 1990 by people who were interested in encouraging those with disabilities to play the game of flat green bowls.The response was good and many joined the Club some of whom were in wheel chairs which are not allowed on the playing surface. However with the help of ScarboroughRotary Cavaliers who raised a significant amount of money special wheel chairs called ‘Buggies’were purchased. Founded by Mike Roberts, the current membership of the club is around forty members although it has peaked at over seventy. The Club meets every Saturday morning from 10am until 12 noon, with a short break at around 11am, playing on four rinks. Membership is open to all who have a disability including people with learning difficulties. If you wish to become a member of this club, or find out more information, the secretary Brian Vasey can be contacted at the Centre on a Saturday morning or by telephoning him on 01723 871867. Alternatively you can e-mail him on brivasey@hotmail.co.ukbrivasey@hotmail.co.uk . Membership costs £5.00 per year, renewable on the 1st October. The two hour session costs £4.00 which is payable to the Centre at Reception, however the first session is free. Shoes and bowls are provided free of charge by the Centre itself. Please note that we cannot provide carers. You must make your own provisions for any assistance that you may require. Scarborough Indoor Bowls Centre is at Scarborough Indoor Bowls Centre. Looking for a tasty Easter Sunday lunch? Scarborough Indoor Bowls Centre is feeling amused at Scarborough Indoor Bowls Centre. Scarborough Indoor Bowls Centre is feeling silly at Scarborough Indoor Bowls Centre.